Welcome to the Fall 2009 newsletter from Rhys Vineyards! This offer includes our first wines from the highly anticipated 2007 vintage. The 2007 growing season was nearly ideal and we are excited to finally be able to release the first half of our 2007 production. 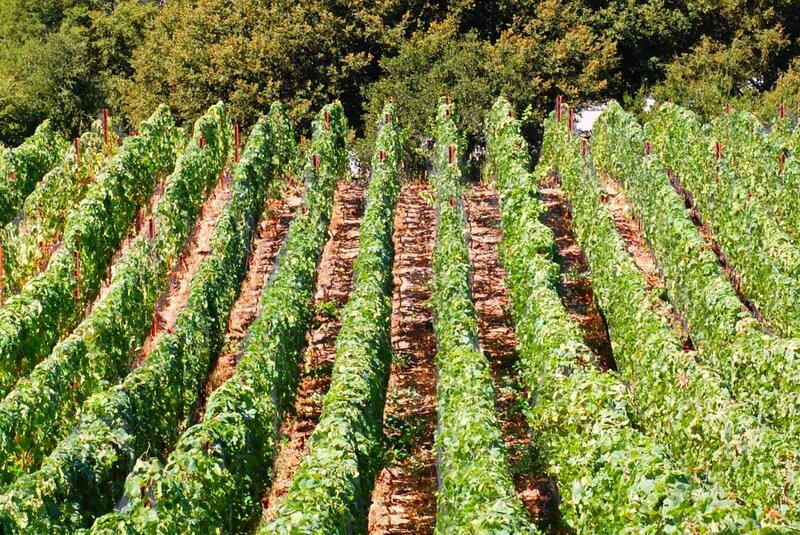 At our Skyline Vineyard steep slopes, undulating terrain and narrow rows preclude tractor work. All farming is done by hand. The 2007 vintage began with a very dry Spring. The resulting dry soil conditions severely limited yields and created small clusters comprised of tiny grapes with thick skins. These characteristics set the stage for wines of great intensity. After flowering in late May and early June, the mild summer weather and cool harvest conditions allowed the grapes to ripen slowly and evenly without excessive sugar accumulation. Great Pinot Noir is all about balance, and low to moderate alcohol levels are required in order to deliver the silky weightlessness that we love. We always strive to achieve ripe fruit with these moderate levels of sugar but in 2007 Mother Nature made it easy. The resulting wines exhibit intense flavors, low alcohol and exceptional balance. It is important to note that our 2007 Pinot Noirs are also quite structured and will require more cellar time than other recent vintages. With the addition of Skyline and Horseshoe, 2007 was also the first year in which we produced wine from all five of our Rhys estate vineyards. 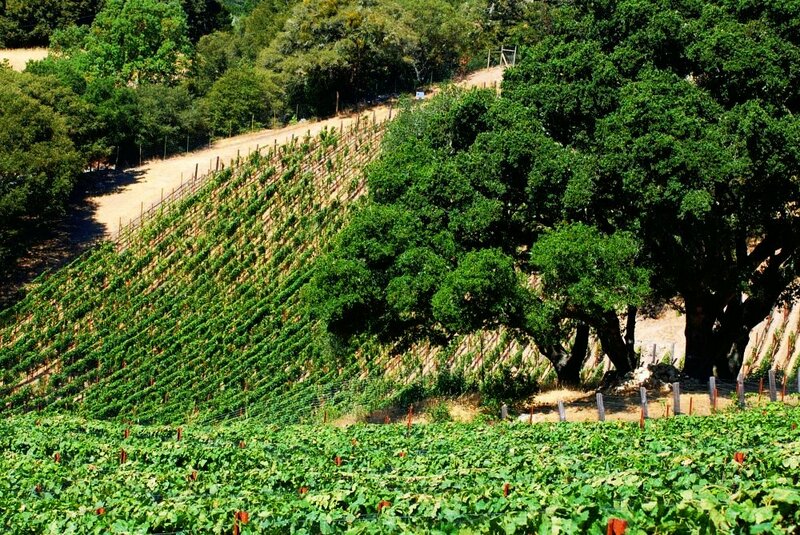 From inception, we gambled that the diversity of rocky soil that is found in the Santa Cruz Mountains could produce wines that are each different, distinctive and complex. Now that we are able to offer wines from each vineyard, we hope you will enjoy exploring their various personalities as the differences are quite remarkable. 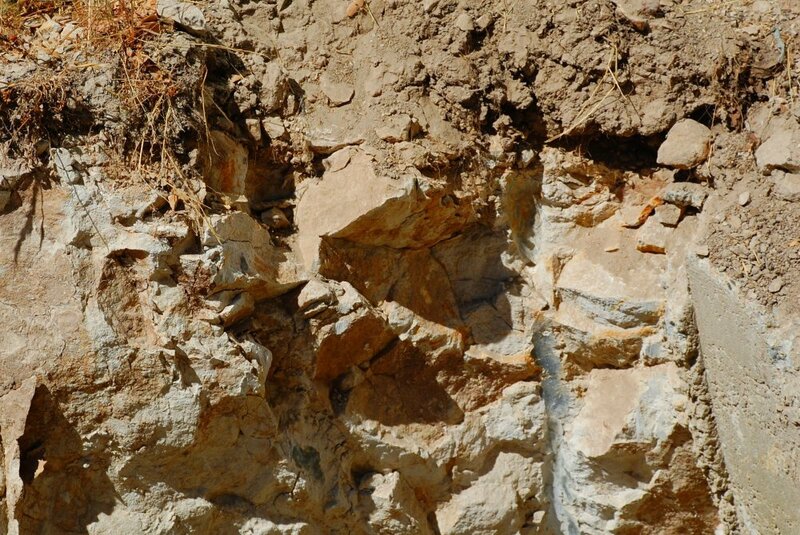 Profile of the rocky subsoil at Skyline Vineyard. 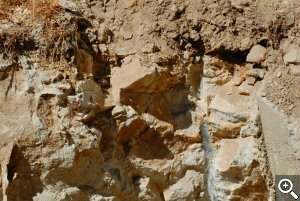 Less than 4″ of topsoil cover a complex mixture of shale, limestone, sandstone and mudstone. 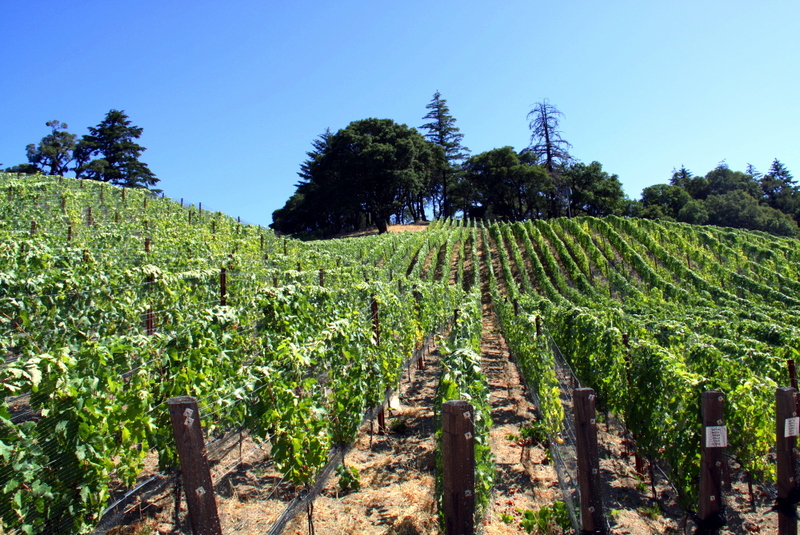 The conditions of 2007 were of great benefit to our Sonoma wines. 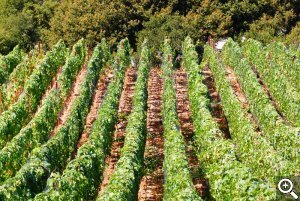 In some years, Sonoma can suffer from excessive yields, but in 2007 the vines found natural balance and slowly ripened their small berries. While many of our customers focus on our Rhys estate offerings, we should point out that the ’07 Alesia Pinots are the best examples of Sonoma Pinot that we have yet produced. As many of you know, in 2006 our Family Farm Vineyard was declassified into what became the very popular Alesia San Mateo County bottling. In 2007, however, Family Farm Vineyard produced its finest wine yet. For the first time since 2004, we are pleased to offer a Family Farm designated Pinot Noir. Densely planted Pinot Noir at Skyline Vineyard. Rows are spaced just three feet apart and vines are spaced only two feet from each other within the rows. This density perfectly matches the lack of soil vigor. Located high above the fog at 2300 feet of elevation, Skyline Vineyard is one of the highest Pinot Noir vineyards in California. 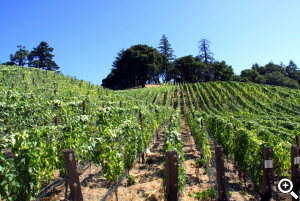 It is located in the Santa Cruz Mountains on the first ridge to the west of the famous Monte Bello ridge. The San Andreas Fault slices in between these two 3000 foot formations. This division is the point where the North American plate and Pacific plate slowly grind and fold together. Over millions of years, this action has created Skyline’s unique mélange of geology that includes shale, mudstone, sandstone and limestone. In fact, with only 4 inches of topsoil Skyline is basically a big undulating pile of fractured rock. The shallow soil conditions force the vines to struggle as they push their roots deep in the search for water. With such devigorating conditions, we decided to plant Skyline with very tight spacing (over 7000 vines per acre). This allows each vine to focus on growing just a handful of grapes. Given its extreme altitude, Skyline experiences an unusual weather pattern that is cool in the Spring and Fall but quite hot in the summer. These soil and climatic conditions result in an extremely unique Pinot Noir which combines ripe fruit, spicy minerality and low alcohol. 2300 feet of elevation, cold winters, cool falls and springs and hot summers combine to give Skyline Vineyard a unique microclimate. Unfortunately our 2007 production is only half that of our 2006 level so we must ask for your patience as many of the wines are quite limited. If you are not allocated all of the wines that you would like, please remember to fill out the Additional Quantities section of the order page on our website. We are often able to fill these requests. Allocations at Rhys are based on aggregate purchase history. As usual, all wines are offered with free UPS ground shipping. If you have any questions about your order, please contact us at info@rhysvineyards.com.